Case summary A 57-year-old woman with morbid obesity (body mass index [BMI] of 43), systemic lupus on steroids, type 2 insulin-dependent diabetes, peripheral vascular disease, unprovoked pulmonary embolism on rivaroxaban, and hypertension presented with 3 days of worsening abdominal pain and nausea. She had an extensive surgical history including a cesarean section, multiple laparotomies for small bowel obstructions (one complicated by bowel perforation requiring resection), and a double-barrelled ileostomy, which had been since reversed. As a result, she had a massive incisional hernia (figure 1). On presentation she was afebrile but tachycardic at 110 beats per minute. Physical examination revealed tenderness to deep palpation in the right upper and lower quadrants. 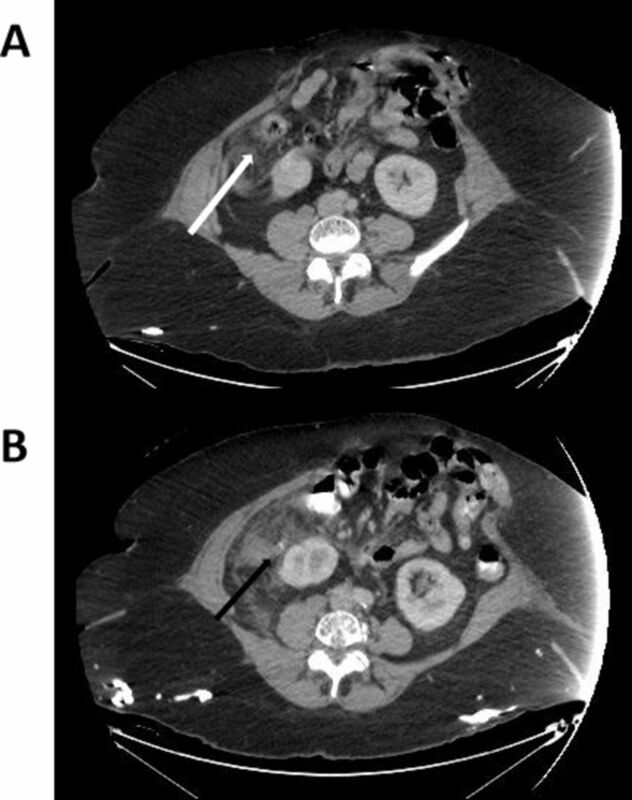 CT demonstrated an 11 mm appendix with an appendicolith outside the hernia sac abutting the right kidney, discontinuity of the appendix tip, free fluid, and associated stranding in the subhepatic region (figure 2A). She was admitted to the surgical floor for a trial of conservative management with ancef and flagyl. On day 3, her pain worsened, her white cell count remained stable at 12 x109/L, her temperature was 37.8°C, she was not tachycardic, and a repeat CT showed a 15 mm perforated appendix with increased periappendiceal stranding and an associated small volume of free fluid. There was no phlegmon or organized abscess (figure 2B). 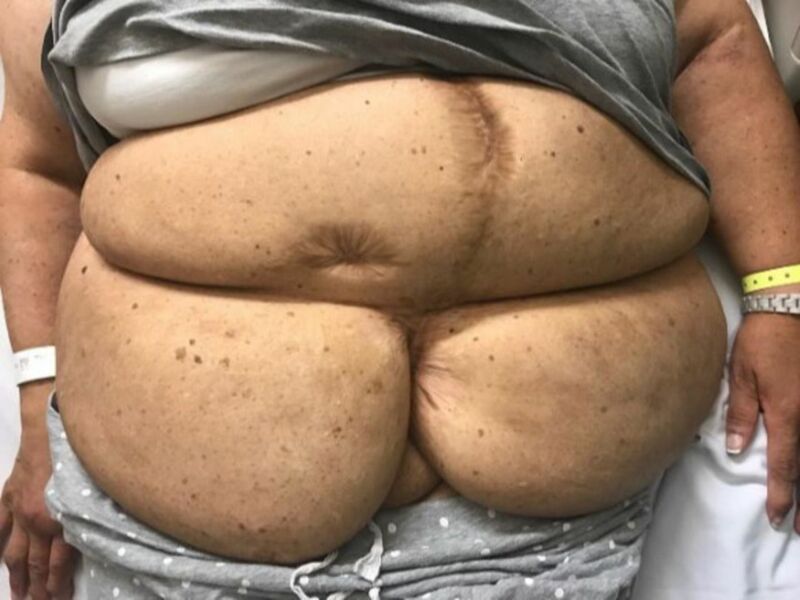 Patient’s abdomen demonstrating midline laparotomy incisional scar, previous ileostomy scar, and massive ventral hernia. Abdominal CT showing increased stranding centered around the appendix, with discontinuity of the wall of the appendix tip and free fluid within the abdomen and pelvis. (A) Admission CT. White arrow: appendix. (B) CT on postadmit day 3 as patient worsened clinically. Black arrow: fecalith. Continue non-operative management with broadened intravenous antibiotic coverage and bowel rest. Laparoscopic ± open appendectomy without concomitant hernia repair. Laparoscopic ± open appendectomy with abdominal wall reconstruction. We elected not to operate in the emergent setting, given that our patient had a potentially hostile abdomen, multiple severe comorbidities, and most importantly no signs of severe sepsis. She was kept nil per os and treated with piperacillin-tazobactam until she was tolerating oral medication when she received Clavulin. Her abdominal discomfort improved during the next 48 hours, and she was discharged home after 1 week. An elective interval appendectomy and ventral hernia repair with a Strattice underlay 5 weeks after discharge was performed. Her interval appendectomy was performed 6 weeks after presentation, which is consistent with published recommendations.1–3 The operation was technically challenging requiring over 6 hours to complete. Fortunately, her postoperative course has been unremarkable. Most studies on acute uncomplicated appendicitis suggest that surgical management is superior to medical management.4–7 However, patients with multiple comorbidities, especially systemic illness or steroid usage,8 9 or those with complicated appendicitis,10 have been excluded from several of these trials. Therefore, we were cautious about extrapolating from their data to predict outcomes in our patient. There is substantial evidence that comorbid patients receiving appendectomy suffer worse outcomes. Postoperatively, obese patients have increased rates of wound infection (5.5% vs. 3.8%) and pneumonia (1% vs. 0.3%).11 As BMI increases, so does the risk of incisional hernia at the port sites for laparoscopic surgery.12 The overall rate of incisional hernia is approximately 6%; however, this incidence triples to 18% in morbidly obese patients.12 Patients with a BMI greater than 30 are significantly more likely to develop an intra-abdominal abscess.13 This could be due to the technical challenges associated with operating on obese patients or be a consequence of immunosuppression secondary to concomitant comorbidities such as diabetes.13 Patients with diabetes require longer postoperative stays in hospital (3 days vs. 1 day for non-diabetics) as they are more than twice as likely to suffer complications such as ileus, surgical site infection, or pneumonia (19% vs. 6%).14 Finally, systemic steroid usage increases the likelihood of developing sepsis as well as increases the 30-day perioperative mortality after appendectomy.15 Given the aforementioned perioperative risks for patients with these comorbidities, as well as the predicted hostility of her abdomen, we thought that a conservative approach was most appropriate. In summary, patients with complicated appendicitis do not always require immediate surgical management; decisions should include a thoughtful evaluation of their individualized perioperative risks. Non-operative management can be feasible and safe under close monitoring. In addition, interval appendectomy should be strongly considered once the patient can be optimized, particularly in patients older than 40.
. ACOI (Italian Society of hospital Surgeons) Study Group on acute appendicitis Antibiotics-first strategy for uncomplicated acute appendicitis in adults is associated with increased rates of peritonitis at surgery. A systematic review with meta-analysis of randomized controlled trials comparing appendectomy and non-operative management with antibiotics. Surgeon 2017:1–12.
. Appendicitis in diabetics: predictors of complications and their incidence. Am Surg 2016;82:753–8.
. Nonsurgical treatment of appendiceal abscess or phlegmon: a systematic review and meta-analysis. Ann Surg 2007;246:741–8. Contributors GS-G wrote the article and performed the required literature search. DG conceived of the idea for the topic and edited the article.